Heat oil for frying in a deep dish pan. In a medium bowl add all purpose flour salt and pepper to taste. Now add corn starch and water and whish well till it turn to thick batter and no lumps. Now add chicken to it and toss to coat all the chicken pieces. Drop in one by one into the oil and deep fry them. Keep on cooking all the chicken pieces and keep it aside on kitchen towel to get the excess oil. In a non stick pan make the sauce for Manchurian. Heat 2 tsp of oil and add onions. Now add garlic and green chilies and cook till light brown. Add soy sauce and Vinegar and mix it well. Then add Ketchup and red chili sauce. Add corn starch mixture and cook till sauce thickens. Keep on stirring well and add 1 tsp of honey and whisk it well. Now add the chicken pieces and toss it well till the chicken is covered in this yummy mixture. Serve hot with tooth picks and sprinkle green onions. 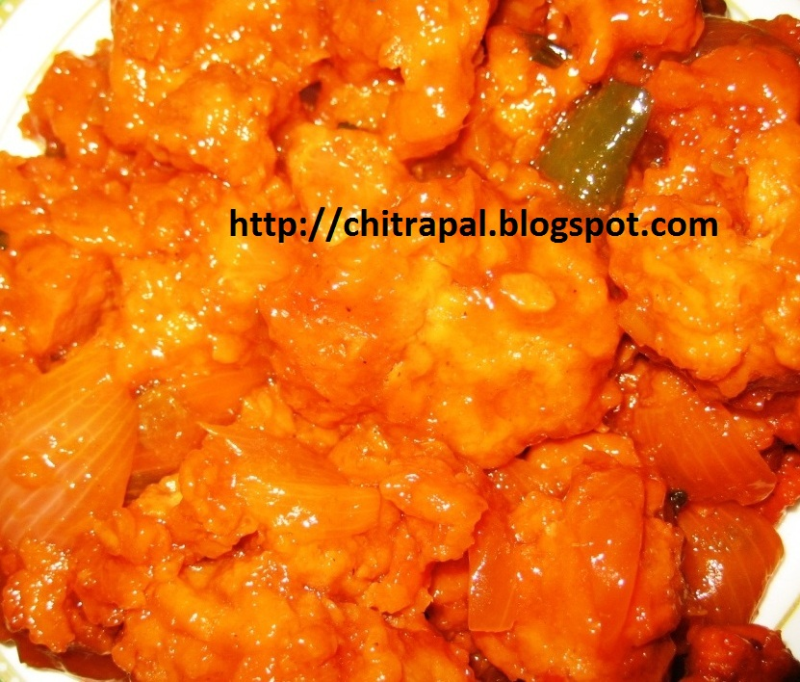 Hey Chitra...out of all the chicken manchurian recipes here,i think yours is the best.Good going !